LG has what could potentially be a whole new line of smartphones up its sleeve, just in time for MWC 2013. The company posted a teaser image of a present wrapped in a bow on its Facebook page, along with the tagline "New series will be unveiled". 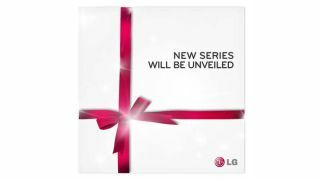 "See what surprise LG has in store for you this time, with an unexpected distinction," reads the picture credit. A European Optimus G Pro? So what could it be? Unlike HTC, there's been no news of what LG could have in store. But Mobile World Congress just around the corner, LG is bound to have something big ready and waiting. The tagline suggests a whole new range of smartphones, instead of just one or two. The LG Optimus G Pro, spotted previously, is a beefed-up version of the Optimus G, but LG has said it won't launch outside Japan. It's a shame, as the G Pro packs a 5-inch screen and 1.7GHz quad-core processor - which might not be quite as much grunt as some handsets set to be unveiled, but is still no slouch. Mobile World Congress is scheduled to kick off on February 24, so we've not long to wait. What do you think LG will unveil? Let us know in the comments.